I've done reviews of Logitech products before so you all know that I love their products and working with this company. The Keyboard controller that's included let's you find shows, surf the Internet, or adjust the volume. Nice! It combines a compact keyboard, a touchpad, and a remote, which gives you full wireless control over all your entertainment without leaving the couch. Enjoy a lazy Saturday afternoon? Don't mind if I do! As a bonus, I'm including the Logitech TV Cam (pictured below). Yup... you read right! 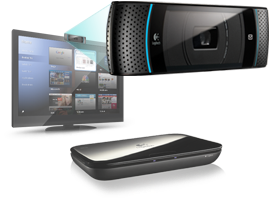 Valued at $149.99, it is the perfect way to get HD video calling on your Logitech Revue. One (1) lovely follower of Mommy Delicious will win the Logitech Revue and Logitech TV Cam... the total package baby! Just leave a comment to enter the giveaway. You can Tweet about it or post to Facebook for two extra entries, but MAKE SURE to @MommyDelicious in your tweet/Facebook post. Also, make sure to leave the extra entries in a separate comment so that it can be counted. The giveaway ends TUESDAY APRIL 5TH! Oh, I so could use those!! Awesome..I would love to win! About to go retweet! I want this!! The Nut Skypes with her grandparents almost every day and we could totally use an upgrade!!! Awesome giveaway! I could certainly use this technology upgrade! Thanks! man this is a perfect way way to relax on my one & only of day. Awesome. I want to win it! Oh my gosh how cool!!! I totally wana win it!! I love technology - unfortunately, I don't have a firm understanding of it all - what I wouldn't give to be a computer nerd!